So, your small business has been doing pretty well, customers continue to find your service and it’s becoming harder and harder to manage their information. Paper files over here and electronic files over there—organization and efficiency are becoming a real concern. You’ve started to consider purchasing CRM software in order to make your life easier, but you don’t quite know where to begin. Here are 5 critical aspects to consider (and that we considered!) when making a selection. CRM’s can be cumbersome, there’s no question about that. 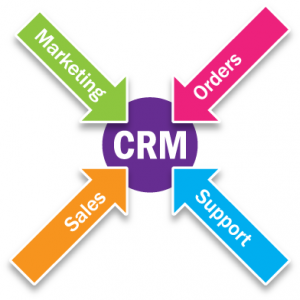 So, depending on the size of your business, choosing a CRM will vary. For example, if you operate a business of 10 employees and getting new hires up to speed quickly is a prime goal, your CRM selection should be influenced by that. If your employee base is larger and you have the luxury of taking some time to fully train each new hire prior to kicking them out of the nest, then maybe you can select a more robust CRM that takes a little more time to pick up. I don’t mean to say you should go with your gut feel when choosing a CRM (I think you can make a slightly more informed decision than that), but rather investigate the platform to see if it offers intuitive design and use. Are the buttons in the right place? Does the standard format in the CRM make sense? Do you feel like you’d have to customize too much? Try to get a gauge as to whether or not your employees will be able to pick it up quickly and enjoy using it. Better yet, make sure some employees are on the decision panel when choosing the CRM – they’re the ones that will be working with it every day. Choosing a CRM that’s geared towards your industry is important. If you sell merchandise for example, then the CRM you choose should not have originally been designed for servicing companies. That seems obvious, but it’s not always easy to tell what industry a CRM is geared towards. If that’s a problem you’re facing, ask the representative you’re dealing with for some testimonials or references from businesses similar to yours. Knowing what other small business think of the platform you’re inquiring about should help you make an informed decision. As always, make sure you know ALL of the costs associated with the CRM. Investigate how much additional user licenses will cost (for when your business grows ), and know how much your CRM provider will charge for additional storage space on their servers in the event that you need it. These are things that are easy to ignore when you have five employees, but impossible to ignore once you hit twenty or fifty. Scalability is a fun thing to consider when selecting a CRM, and arguably the most important if you’re actively growing your business. If you see any indication that the CRM’s expansion capabilities are limited, address those concerns with a rep. Also check the system’s ability to integrate or collaborate with other business applications if you can foresee that need. Most importantly, are you going to be able to get the support you need? And, to the above point, how much will that support cost? During the sales phase, the reps you’re working with are there to help you make a decision, so use their eagerness to your advantage and ask as many detailed questions as you need to feel good about the decision. After all, choosing a CRM is a big step in the growth of your company! My name is Sean VanderVliet. I’ve been part of the Customer Care team at PaySimple since May of 2009. I help customers understand how to use our software in the best way for their business. Born in Iowa and raised in New Hampshire, I am an American wanderer who dreams of big trout and day-night doubleheaders. Colorado has not been a mention in my life for very long; I began driving here the day after I graduated from (Bates) college in search of the Wild West and its gold riches. I listened to the song Big Country by Bela Fleck for much of the trip and I feel like I found that. I made my homestead in the Capital Hill neighborhood where I began living with my roommate, and 2009 World Jart Champion teammate, Austin. When I’m not working, I’m probably hiking with my lady, Beth, and her chocolate lab, Walter. I also have a passion for playing, watching, and researching baseball, playing tennis, riding my bike, and anything else considered active. I have always enjoyed reading, one of my favorites being Extremely Loud and Incredibly Close by Jonathan Safran Foer. Give it a try and you won’t put it down.